Are you planning to clean up your home siding? Your driveway, door front or decking? Your patio furniture or garden tools? 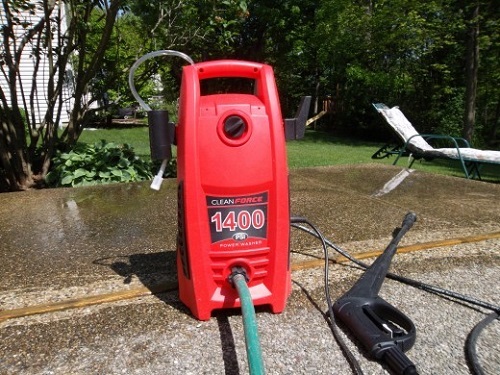 An electric pressure washer unit would be your best solution. You cannot realize how much useful it is until you lively use it. Once you use the machine for any kind of domestic cleaning, you surely would be surprised that how could you ever live without using this miracle. It’s amazing! There are several types of electric pressure washer for different purposes; domestic light duty use or industrial heavy duty use. As you are looking for a pressure washer machine to clean your residence, make sure that you choose the right pressure cleaner to meet your needs. Here we interpret what you need to look for to own the right device for your respective domestic cleaning. The working mechanisms of all types of electric pressure washer are almost same. They basically work the same way. It is simple. At first, the water needs to be entered the unit at low pressure. Then the built-in electric motor or engine powers the pump to bump the water through the hose and spray out the water like jet spray at an extreme pressure. This procedure is importantly more effective to clean the objects or surfaces around your home than what your garden hose offers you to meet the requirements. 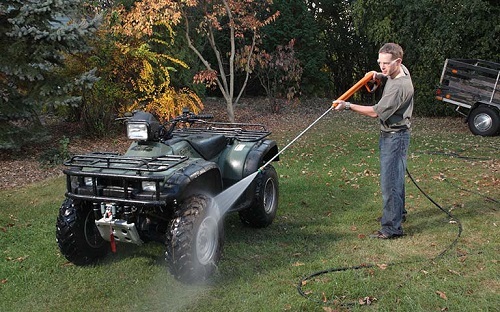 A domestic electric pressure washer is ideal to clean anything in or around the home. For your better understanding, you could remember the following list that includes most of the possible areas you can clean with your domestic power cleaner. What PSI and GPM Range Do You Need? It is important to identify the level of PSI (pounds per square inch) and water flow rate to use your pressure washer for home use. These pressure washer units are classified in accordance with the PSI. PSI refers to the total amount of pressure generated by the power unit. For example, an identical garden hose distributes water at the rate of approximately 30 to 40 PSI. Again, a coin-operated vehicle wash distributes almost 700 PSI. On the contrary, an electric pressure washer distributes water at over thousands PSI. This is not the whole story. There is another consideration to take; GPM. GPM (gallons per minute) refers to the amount of water flow meaning how many gallons per minute. If the combination of PSI and GPM is larger, it can cover a larger area to clean more quickly and more effectively. Notice the following table that grades the units depending on the volume of work and frequency of the unit to be used. Small to medium occasional domestic use 1500-2000 PSI 1.5-2 GPM Cars, boats, furniture, lawn mowers, pavements, door fronts, patio, driveways, decking, garage, house siding, gutters, windows etc. Medium to large frequent domestic use 2000-3000 PSI 1.8-2.5 GPM Bigger outdoor areas, whole house siding, trucks, brickwork, concrete walls, caravans etc. The simple theory tells that the bigger the projects, the larger the pressure washer you would require. If you need to clean a small job but occasionally, an electric pressure washer capable of generating 1500-2000 PSI would be preferable. By contrast, if you need to finish a larger domestic cleaning job very frequently, you can choose an electric washer with the capacity of 2000-3000 PSI. What Type of Pressure Washer for Domestic Use? For your domestic cleaning uses, the common type of washers is an electric pressure washer. They are comparatively lighter in weight and compact in design. They require you less maintenance and movements. You just need to plug it into your electric power output to start. They can perform to run all types of domestic works; small to very large. On the other hand, there are petrol powered pressure washers. They are ideal for commercial heavy-duty use only. They are heavier and they need more maintenance and movements. They are also expensive to buy. They cannot meet your domestic cleaning demands as your convenience. What Attachments Do They Come With? o Accessory kit that includes brushes, patio cleaner, stain removing detergent etc. Sometimes, some of the manufacturers might include some additional tools in the box to make the package standard. Clear? Or confused? We would simply suggest you buy an electric pressure washer from a top-quality pressure washer brand. A good quality manufacturer offers you a reliable warranty and a national customer support network. Honestly, we would recommend some international pressure washer companies like Gerni, Generac, Crommelins Subaru, AR Blue Clean etc. 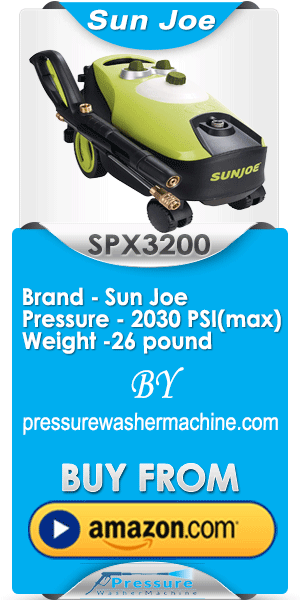 They are the top winners in the pressure washer market. They have been reigning the market for decades. For your domestic purposes, remember the above-discussed requirements and don’t hesitate to buy from one of the recognized brands. Make sure that your pressure washer contains the configuration that is stated in the table above to suit your domestic needs. If you consider a model from these manufacturers following the required specifications, you will be getting high-quality performances. In case of any wrong or any fault related to the product, they will be with you by their nationwide service and support departments. It is no good to buy a very cheap and no brand electric pressure washer. Be aware of choosing them. Typically there are many products on the market that have no service agent to support you. Also, there might be no warranty to worth you.